I've blogged about my kids getting older and how amazed I am at how time flies. I've even put pics of their growth for all to see. When my babies were born, I was unprepared (to say the least). I had no idea how I was going to handle the responsibility. I still felt like a kid myself (that has yet to go away). I was so involved in being organized and keeping everything clean and tidy that, much to my dismay, I missed out on a lot of time of just being with my babies. I wish I could do it all over again, only with what I know now. But, sadly, we don't get parental do-overs. I do think I've done the best that I can, and I've tried to adjust my OCD enough so that I don't spaz out at every mess that is made. I even try hard not to HAVE to do the dishes immediately after dinner, just so that we can all sit at the table and prolong our conversation. When the boys were babies, I used to read to them a lot. They were even potty-trained with a book! LOL! There was one book I remember reading that describes what it feels like to be a mom in such a loving way. It's called "Love You Forever" by Robert Munsch. One of the main lines is "I'll love you forever, I'll like you for always, as long as I'm living my baby you'll be." So my kids are literally an inch shorter than me (which is not THAT tall yet because I'm a typical "shorty" Latina). I used to have them stand on a bench in order to brush them or put their ties on. Now, I have to stand up and my shoulders hurt from stretching after doing it. But no matter how tall they get or how their voices are changing "my babies they'll be." With that sentiment in mind (and the typical "Sandy twist"), I made a silly quilly. And, then, I made another one because I was on a roll (padum-ching!). Here they are. I tried hard to make an original owl shape. It was very hard because there are tons of amazing and talented quillers out there. I love my colorful owls (if you've been reading Sweet Spot for a while, you know I have a thing for them). I'd also love to hear your feedback! On another note, I have special news! My next post will be my 100th blog post. WOW! I can't believe I've had that much to say - LOL! 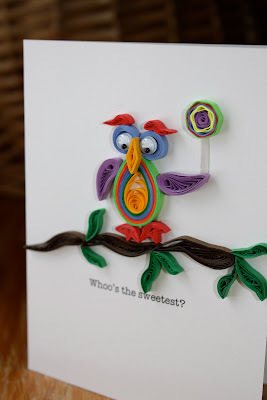 I'd love to do another quilling blog hop, and I have some amazing quilling blog candy that I'd like to include. BUT (here's where you all come in), I need my fellow quilling bloggers who are interested to let me know if you'd like to participate. You can comment below or you can e-mail me at sweetspotcards@gmail.com. I'd love to have an international quilling blog hop, so it's open to any quiller anywhere in the world. Feel free to share the news. I look forward to your e-mails and comments! Cute. I loved the colored rainbow colored owl. Congrats on your 100th post. What a lovely post! Absolutely loved reading it.. Congratulations on your 100th post. I love your google-eyed owls, especially the lollipop fellow! Congratulations on a hundred posts - it's been fun getting to know you. I really do love your owls. There is not much that you make that I don't love. I pretty much love it all and I am in on the blog hop too. I managed a book store many years ago and that was always one of my favourite books. Congrats on your 100th post Sandy! and count me in on your Hop! These are soooo cute !! You are right, there are a lot of amazing quilling artists out there. But we can definitely tuck your little owls in amongst the greats...they are wonderful! Thank you all for your lovely comments and feedback. We have a great list of quillers so far. 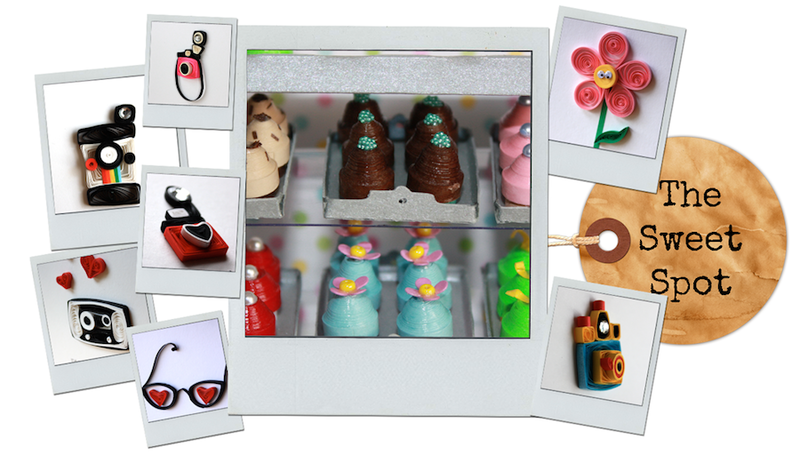 Stay tuned for #100 and a quilling blog hop that'll sweeten anyone's day! My mother always loved owls and so I too have a special place for them... you did a great job, I love using those wiggle eyes (they are too much fun!). I would love to participate in your blog hop... I will run over right now and post your button... if you could send me information that would be great! Congrats for your aniversary Leesandra!!! i like your nice idea and your cute quilling work! 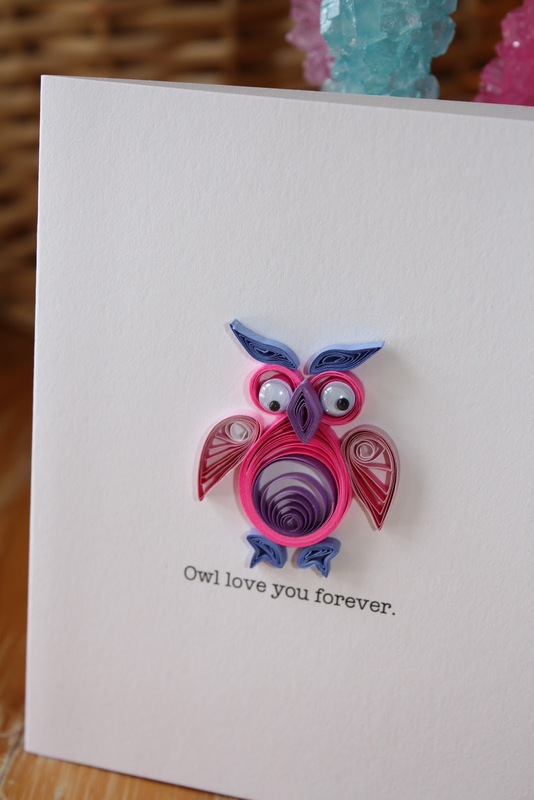 I love your quilling especially these cute little owls. Thanks for the inspiration! I love looking at others quilling. You are one of my favorites. Keep blogging I am now a follower. Hope fully soon I will get some pictures up of my quilling!